Brent oil prices increased by 3.58 % or US$2.57, as prices rose this week. Oil traded on April 19, 2018 at a price of $74.33 per barrel relative to US$71.76 last week. Brent oil began the year at US$68.07 per barrel. 87 Octane prices increased week over week, by 1.20% (JMD$1.48). Additionally 90 Octane rosel by 1.17% or (JMD$1.48) week over week. 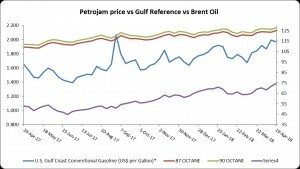 87 Octane and 90 Octane opened the year at J$121.04 and J$123.88 respectively and now trades at J$124.89 and J$127.73 per litre respectively. Increase production of Canadian crude oil has risen expansions in pipeline takeaway capacity, causing Canadian crude oil prices to go down and increasing the exports by rail to the U.S. However, the growth in volumes of Canadian crude oil by rail is very much uncertain irrespective of the demand for the commodity, especially on the U.S. Gulf Coast. Canadian Crude oil production rose to 3.9 million barrels per day (b/d) in 2017, up by approximately 300,000 b/d from 2016. However, crude oil pipeline capacity out of Canada has not been able to keep pace with growing production. Many pipeline projects some to the U.S. and others throughout Canada to the Atlantic and Pacific Coasts for export, are either cancelled or delayed. In addition, the 590,000 b/d Keystone pipeline is currently limited to 80% of capacity since a leak in November.